Habib: I didn’t encounter the concept of a writing center until my undergraduate studies at Mason. In the Lebanese school/French lycée system, writing was not taught as a process. Students were often required to write decontextualized essays in class or at home that demonstrated their mastery of literary/philosophical concepts without any feedback or conversations on drafts. During my undergraduate studies at Mason, I visited the writing center once, but couldn’t appreciate the possibilities of the peer-feedback approach yet. It wasn’t until I was hired as a graduate research assistant for Terry Myers Zawacki and Chris Thaiss’ book, Engaged Writers, Dynamic Disciplines (2006), that I learned about the work of writing centers. I sat in the back hallway of the writing center and transcribed dozens of Terry’s and Chris’ interviews with faculty across the curriculum describing their own experiences as writers, and how those experiences informed their writing pedagogy. As I typed and typed for hours, I watched students and tutors interact in thoughtful conversations about writing projects. Through listening to faculty perspectives and observing tutors and students in action, I began to understand pretty clearly that the role of writing in the US academy was significantly different than its role in non-US academic contexts like the one I grew up in. WLN blog: During your work as a MFA student, you came to be a writing center director at GMU (one of the most diverse, busiest universities in the country!). Habib: Yes. As an MFA student in Mason’s Creative Nonfiction track, I worked on a collection of personal/historical essays titled, “A Block from Bliss Street: Growing up as a Child of the Lebanese Civil War” (Habib, 2006). During my second year in the three-year MFA program, I received a TA-ship to teach the introductory composition and literature courses. An integral part of TA training at Mason is a one-year experience tutoring in the writing center while also taking pedagogy courses in composition and literature. In my second year as a TA, the Assistant Director of the Writing Center stepped down, and the Director at the time, Terry Zawacki, asked me to step in as an Acting Assistant Director. The following academic year, post-graduation, I was hired as full-time Assistant Director and Term Assistant Professor of English. I remained in a leadership role in the Writing Center from 2006 until 2011, promoted to Associate Director and then Acting Director when Terry Zawacki stepped down from her Writing Center Director position in 2009 to focus on her role as WAC Director. WLN blog: You are now the associate director of composition and manage the graduate writing-across-the-disciplines courses. How have your personal and professional experiences prepared you for these multifaceted and challenging roles? Habib: Advocacy has been a central tenet of my personal and family life. Both my parents worked as ecumenical and humanitarian activists and one of my grandfathers was a well-known liberation theologian, so I grew up listening to them and watching them diplomatically challenge existing systems and seek creative and compassionate solutions for serving vulnerable and oppressed populations, specifically in the conflict-ridden Middle East. This backdrop to my childhood and young adulthood has influenced how I think about my work as a researcher, teacher, and a WPA. The collaborative research I have been engaged in since 2006 has given me significant insight into the institutional constraints around supporting multilingual, international and other vulnerable students and the required pedagogical and material resources necessary to adjust to the growing international demographic. During my work in the Writing Center, I collaborated on several research projects involving multilingual students. As a multilingual immigrant writer, myself, I was drawn to such projects, and in my role as the Associate Director of the Writing Center I was committed to developing better resources and support mechanisms for our multilingual and international students. My first collaborative project (with tutors and then director, Terry Zawacki) involved the production of a monograph and website titled, “Valuing Written Accents.” For this project, we interviewed twenty-six multilingual and international undergraduate and graduate students at Mason about their experiences adjusting to writing expectations in the North American academy. During the interviews with these students, I found myself deeply identifying with their experiences and needs and realizing pretty acutely that the academy has a long way to go to adjust to its growing international demographic. That observation became even more substantiated when I embarked on another research project with Terry Zawacki, interviewing faculty across the curriculum about their perceptions of error in multilingual student writing. Our co-authored articles on this topic appeared in WAC and Second Language Writers: Research Towards Linguistically and Culturally Inclusive Programs and Practices and in an invited article for the College Composition and Communication journal’s special issue on internationalization. In my time at the Writing Center, I found myself questioning specific aspects of writing center pedagogy and policy. I wondered if some of the field’s tried-and-true practices worked for our multilingual students. Does asking the students to read the paper out loud make sense when English is not their first language? Does focusing on Higher Order Concerns mean language concerns should be relegated to a lower order? Isn’t clarity at the sentence-level so inextricably connected to meaning-making? And, what about the writers’ anxiety about their own errors or first-language interference? Is it fair to tell them that those concerns are secondary when for them clarity in English is the source of serious anxiety? Doesn’t it make sense to meet our students at their place of need first to reduce their anxiety before delving into the other goals for the session? Is 45 minutes enough? Is the ten-session per semester limit too restrictive? Doesn’t language development require frequent and consistent support, ideally with the same trained tutor? After considering all of these questions and consulting with my graduate assistant directors (among them, former WLN’s blog editor, Josh Ambrose! ), I decided to develop the “ESL Opt-In” program where I basically suspended many of the traditional tutorial practices and policies in order to accommodate the different needs of this population. You can read more about the program here. In 2011, I stepped down from my WPA role in the Writing Center. But, I’m pleased that the ESL Opt-In program continues to be a success, under the strong leadership of our current Writing Center director, Susan Lawrence. I feel a deep sense of accomplishment as a result of that effort because I recognized the need to challenge some of our field’s dominant philosophies and practices in order to advocate for the needs of our diverse students. This was my first formal experience with advocacy work within higher education. Now, in my current position as Associate Director of Composition, I am responsible for the first-year composition courses designated for multilingual writers, including provisionally-admitted undergraduate and graduate international pathway students, domestic multilingual students, and foreign students at our branch campus in South Korea. I find myself once again thinking about how to advocate for these different populations and the faculty working with them: what might a policy/position statement on SEAE look like? How would it serve the students and the faculty and raise awareness at the institutional level about the nature of foreign language development and proficiency? What type of faculty development initiatives would best serve our composition instructors with limited, if any, knowledge of second language acquisition or second language writing research and best practice? How might a cross-site assessment project help us reveal the challenges, strengths, and needs of our resident multilingual students; our international pathway students; and our foreign students at our South Korea campus? These are all questions I am grappling with in my position, and, however, difficult it feels at times, especially given the institutional constraints, it is the advocacy nature of the work that keeps me going. WLN blog: Tell us a bit about your recent return to Lebanon—both as a visitor, and as a professional. Habib: I was recently hired as an external consultant to the University of Balamand, an independent Lebanese university in the North of Lebanon. This consulting job has presented me with the opportunity to return to Lebanon on several occasions, which has been a very grounding and enriching experience for me. It has given me the opportunity to integrate my experiences as a child of the Lebanese civil war, my bicultural, multilingual identity, and my newer professional identity as a WPA-advocate. 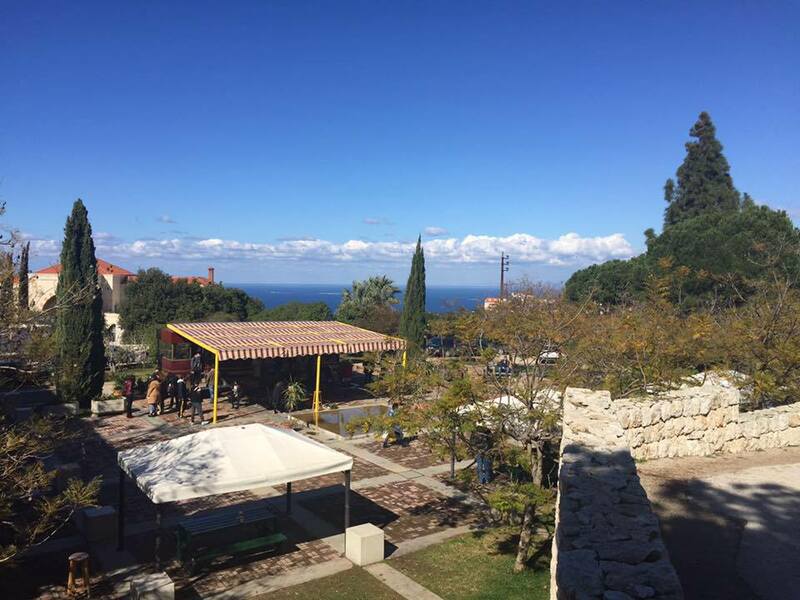 WLN blog: How did your connection with the University of Balamand come about? 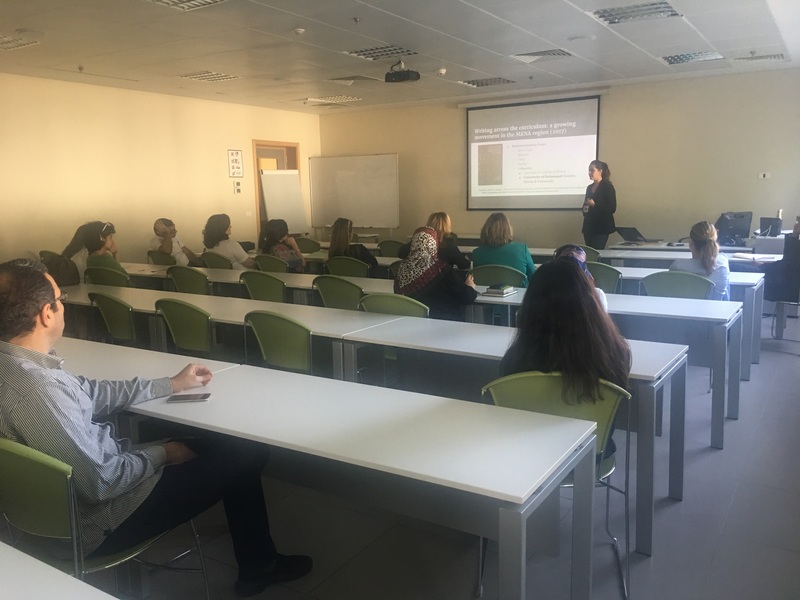 Habib: On a recent trip to Lebanon to see my extended family, I visited a dear friend of mine, a PhD in Instructional Design from George Mason University, who was hired as the Chair of the Education Department at the University of Balamand. Since I’ve always been curious about potential future work in Lebanon, she set up a meeting with the Chair of the English department. During our conversation, the Chair described some of the challenges the composition program was facing and the need for someone with WPA experience to support and advise the local leadership. I expressed my interest in consulting work with the department to help them a) expand their English Language Center into a Writing and Speaking Center, b) lead faculty development workshops for the composition instructors, most of whom do not have backgrounds in compositions, but expertise in Linguistics, Translation Studies, Literature; and, c) facilitate a writing program assessment to identify the needs and growth areas for the program. This opportunity was especially significant to me because of my family’s ties to the university. As a leading ecumenical activist in Lebanon, committed to interreligious dialogue and understanding in a region fraught with sectarian violence, my father worked closely with the founder of the university, the Patriarch Ignatius IV of Antioch and All the East for the Greek Orthodox Church. The university’s mission is “inspired by the tradition of the Antiochian Christian Orthodox Church in promoting the welfare of humanity and its highest values (…) and is committed to principles of tolerance, compassion and openness and to Christian-Muslim understanding.” The invitation to work at this university that espouses the same principles my father committed his whole life to was an opportunity I could not turn down. 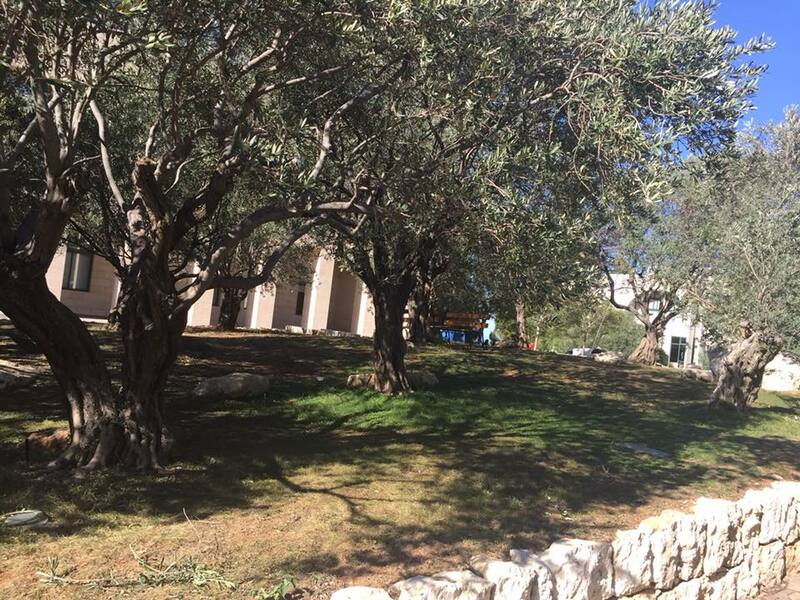 Olive trees on the campus. WLN blog: What are the challenges and opportunities in this? Habib: I have been thinking about the work I’m doing with the English department and Writing Center as fostering a culture of writing on campus. My work follows MartyTownsend’s WPA consulting work at the University of Balamand and her collaborative publication with Maureen Nicolas and Samer Annous in the WAC Clearinghouse International Exchanges on the Study of Writing publication, Emerging Writing Research from the Middle East and North Africa (2017), edited by Lisa Arnold, Anne Nebel, and Lynn Ronesi. Annous, Nicolas, and Townsend’s article, Territorial Borders and the Teaching of Writing in English: Lessons from Research at the University of Balamand , ends with a call for more WAC-focused initiatives on campus, and I see my work as taking up that call. My approach to this “writing culture” project is to begin in the Writing Center, currently called the English Language Center, by expanding its visibility and reach and transforming its reputation as a space for remediation. In its current iteration, the ELC serves a very small percentage of the University. The Center’s branding as an English Language Center positions it as a support-service for the English Department (the intensive English and composition courses, specifically). So, it’s perceived by students, faculty and administrators as a remedial space for students to “get help” with their English skills. This is reinforced by English instructors requiring their at-risk students to work with an ELC tutor regularly in order to improve their English fluency. In response to these students’ needs and the request of the instructors, tutors at the ELC often perform a more directive, teacher-centered role by teaching students mini-language lessons and assigning students homework to complete before their next appointment. In the work I’m doing at University of Balamand, I think the re-branding and professionalization of the ELC can play a crucial role in building a culture of writing on campus and building momentum around the role of writing in learning across the curriculum. Those of us in writing studies (in Western contexts) believe in a writing-across-the-curriculum model that fosters students who are strong critical thinkers and communicators equipped to compete in the global market. I’m working with the local leadership at University of Balamand to promote an institutionally-endorsed, writing-across-the curriculum model through the expansion of the ELC into a formalized Writing and Speaking Center. 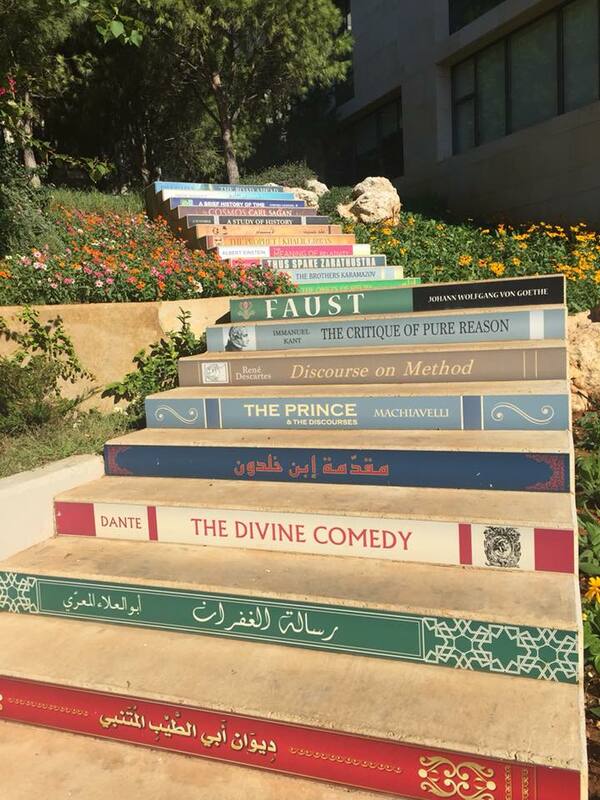 Balamand has a real opportunity to achieve its mission and to enhance its reputation among the elite Lebanese universities like LAU (Lebanese American University) and AUB (American University of Beirut), both of which have well-established and recognized writing centers and writing-across-the-curriculum programs. What I find particularly interesting is that unlike these American-chartered universities, I think Balamand is in a very interesting position to develop a writing center model that does not necessarily subscribe to the U.S. approach. WLN blog: How can the writing center communities in the North America connect with and support our colleagues abroad? Habib: Through projects like this! Through international conferences located in different parts of the world. Through collaborative publications between US-based writing center folks and tutors/WPAs at universities overseas. And, through other creative and courageous experiments. What about a tutor-exchange program with universities overseas, for example? What if IWCA had a scholarship for something like that? Or, even just online “Tutor Dialogues” among tutors in a US institution and tutors overseas? Or, what about a WLN special issue led by guest editors at international institutions? And, maybe more focus on independent local universities rather than just American universities overseas? U.S.-based tutors and WPAs have so much to learn from what is happening overseas, which we can see from scholarship in the field like Thais et. al’s (2016) Writing Programs Worldwide; or Payne and Desser’s (2011) edited collection Teaching Writing in Globalization; or Marin’s (2015) edited collection, Transnational Writing Program Administration. WLN blog: If someone wishes to consult or visit a center abroad, what steps would you recommend? Habib: I hate to rely on cliché advice, but network! Writing studies people really are all connected by a huge global network, for some of us the degrees of separation to international contexts might be closer, but we are all connected through our professional organizations or visiting scholar programs at our institutions. Connect with international students and visiting scholars on your campuses. Learn about their writing programs or writing/language centers (or lack thereof). At conferences, attend presentations by international colleagues and stay afterwards to talk to them and exchange contact info. Propose cross-country research projects with international colleagues. Follow the research on transnational and multilingual writing center and writing program work. WLN blog: You are someone who cares deeply about social justice. I think that’s something that matters to many of our colleagues. What do you see as the opportunities and challenges for writing centers (and composition folks!) to get involved, empower, and advocate on behalf of others? Habib: I think the first step is for us to recognize that we aren’t necessarily always the best advocates for others, that we don’t know what’s best for local contexts overseas, and that it’s dangerous for us to assume that we can draw on our own epistemologies or practices when we’re overseas. In many ways, collaborating or consulting with programs in other parts of the world is equally (maybe almost more) important for us than it is for the institution abroad. The experience points the mirror back at us, revealing our own inherent assumptions and practices in ways that can really stretch and revolutionize our work and scholarship. As a multilingual writer/thinker myself who has experienced a variety of educational contexts and approaches, I’m hyper-aware of generalizing, or to borrow Edward Said’s term, “orientalizing,” international education models. Of course, there are aspect of our pedagogies or programmatic approaches that could be of value to other contexts/communities/cultures, but we also need to go in with openness and humility that our ideas often will not work in a culture with its own values and principles, traditions, systems of operation, and vision for growth. In my experiences with Balamand, I’ve been asking myself often, how my conversations with faculty and students there can/are changing the way I think about our practices in the U.S., about some of the epistemologies we are so attached to. Sometimes I think that as soon as we use the framework of “social justice,” we are assuming that certain communities should act on behalf of others; we are accepting a certain power differential as a given. Yes, of course, if we see explicit injustice somewhere, anywhere, we should stand in solidarity with the disenfranchised and speak out. But, as WPAs and compositionists, I believe our job ought to be more about listening and learning from our international colleagues and questioning our normative assumptions than about exporting our existing models or ways of thinking to contexts that may not want it or need it. And, if they do, our new challenge as a field is to think about how to blend our traditions/values and practices to integrate the best of both contexts. It’s exciting and enriching work. Chamie, J. (Winter 1976-77). The Lebanese civil war: an investigation into the causes. World Affairs, 139(3), pp. 171-188. Retrieved from https://www.jstor.org/stable/pdf/20671682.pdf; Sune, H. (2011). The historiography and the memory of the Lebanese civil war. Online Encyclopedia of Mass Violence. Retrieved from http://www.sciencespo.fr/mass-violence-war-massacre-resistance/fr/document/historiography-and-memory-lebanese-civil-war.